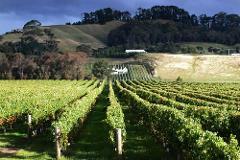 Hawkes Bay is a stunning coastal wine region located on the east coast of New Zealand’s North Island. A world class wine region and complete with over 200kms of cycling trails that a flat, safe and peppered with wineries, food and famed Kiwi scenery. Join this exclusive tour and enjoy behind the scenes wine tastings, gourmet food and premium accommodation throughout, along with a local guide and full support. We can’t think of a better way to discover this beautiful region. After collection from Napier airport we arrive at our gorgeous seaside accommodation at The Crown Hotel overlooking the waterfront of Napier. 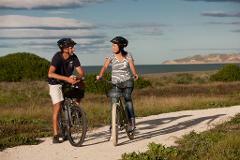 Early arrivals can warm-up with a ride around town on the beachfront cycling trail, or simply wander around Art Deco Napier exploring the fishing port or even the Hawkes Bay Museum Theatre Gallery. This evening we will enjoy our first group meal, where you will meet your guide, ask as many questions as you like, and get to know your fellow cyclists. Conveniently, and to allow for late comers and drivers, we will dine at the Crown Hotel restaurant Milk and Honey. Your two-course meal is included in your tour. After a full breakfast at the Crown Hotel, our first day in the saddle is a morning cycle via the Ahuriri Estuary to Taradale, using the flat off road ‘Water Trail’ that leads out of Napier. Wonderful water views and abundant birdlife is all around us. We enjoy a stop at Church Road Wines where we are treated to a platter style lunch of local gourmet delights, and our BONUS Behind the Scenes winery tour. This is a food and wine tutorial style tasting where you can chat with the winemaker/s and learn more about this great winery. 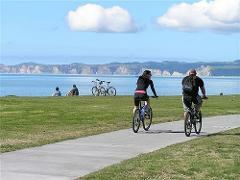 We jump back on our bikes and head to Mission Estate Winery, New Zealands oldest winery, for a visit and tasting. Dinner is at a local Thai restaurant (casual 3 courses included) with accommodation at the Colonial Lodge Taradale. Total distance covered today is 20kms, with an optional cycle around the Puketapu Loop (20kms) for those feeling energetic. After a full breakfast we cycle from Taradale heading to the more open vineyard area known as ‘Gimblett Gravels Appellation’. Enjoying the flat off road ‘Water Trail’, and then joining the ‘Wineries Ride’, we will stop at a number of superb wineries including Te Awa Estate, Trinity Hill, Salvare Estate – where we will enjoy a gorgeous platter style lunch amongst the vines - Ngatarawa Estate and Abbey Cellars. We are then transferred by bus to Havelock North to our accommodation at Havelock North Motor Lodge. Total distance cycled today is 35kms all flat and slow paced with lots of stops! Dinner tonight is a major highlight, and is at the stunning Craggy Range Winery, dining at the 5 star Terroir Restaurant enjoying a 3 course experience, all included in your tour, as well as return transport. What a treat! After enjoying our breakfast in Havelock North, we jump back into the saddle and cycle our way toward the coast. A slightly longer day’s cycling, but still lots of time to visit a number of our favourite wineries, we will set off a little earlier. Lunch today is at the lovely Clearview Estate Winery, and visits to the incredible Black Barn Vineyard, Te Mata Estate Winery and the unique Elephant Hill winery are all included on our way along the coast back to Napier. 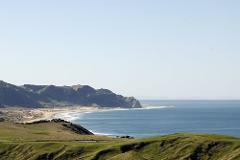 Today’s cycling will cover approximately 50kms over flat, off road trails with lots of stops, finishing with delightful coastal scenery as we head back to Napier. Arriving back ‘home’ to the Crown Hotel, dinner on our final night is at the Shed 2 Bistro on West Quay (casual pub style, 2 courses included), where we can debate our favourite winery or the best wines, and exchange contact details with our new friends. 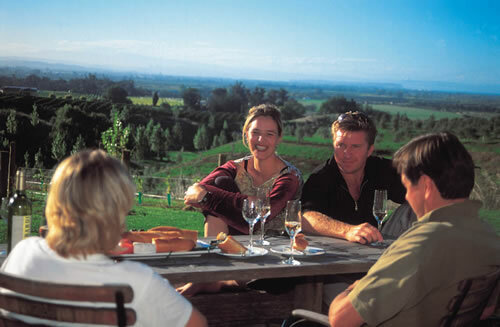 Sleep soundly knowing you have visited the best wineries, tasted the local produce and cycled the best of the Hawkes Bay Trails.